Our big boy, all around pad is the SoIll Carcass Catcher. The pad has tons of ground coverage (60″ X 44″), good and thick foam (5″ in total), and has been pretty durable so far. We’ve drug it all over the country using it to catch big falls, small back thumpers, and everything in between. 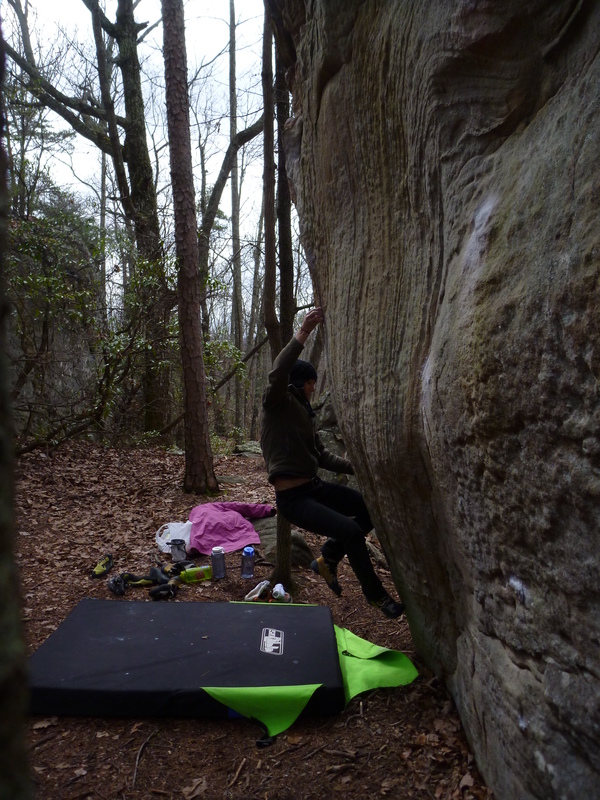 The pad is thick, but I would hesitate to call it a true highball pad. You would have a hard time missing it, but the hybrid hinge and slightly soft foam don’t inspire confidence from way up. The pad is far better at covering a lot of ground for slightly traversing problems. The soft foam really comes in handy when you smack back first again and again. Plenty of energy is absorbed without really knocking the wind out of you. Definitely the pad I prefer to land on for most falls. It makes a pretty sweet bed, mainly due to its size. It is a touch on the short side for adults, but you really can’t beat the cushioning and insulation you get out of a pad this size. If you’re a side sleeper you’ll likely love it. We’ve had the pad for a little over a year now. No complaints as far as durability is concerned. The buckles are metal on the female end and plastic on the male. We haven’t broken a male buckle yet, but if we do they are easily replaceable. SoIll included some replacements when I first got it, though I subsequently lost them. I think the pad could be far better designed for carrying. The shoulder straps are uncurved and pretty uncomfortable. Couple this with a soft and wide webbing waist belt and it really isn’t a lot of fun to carry. I find that the pad’s weight isn’t really well supported by the belt, causing it to sag and then pinch. It is a pretty good pad for carrying equipment. The flaps that close the pad keep your stuff in pretty well, though small stuff should probably go in the stuff pocket in the main flap. I really like the pad, especially if you can find it on sale. If you’re paying full price and have long approaches where you boulder I would probably look in to a pad with a better carrying system. If you mainly do short approaches, I would definitely give this pad a close look.